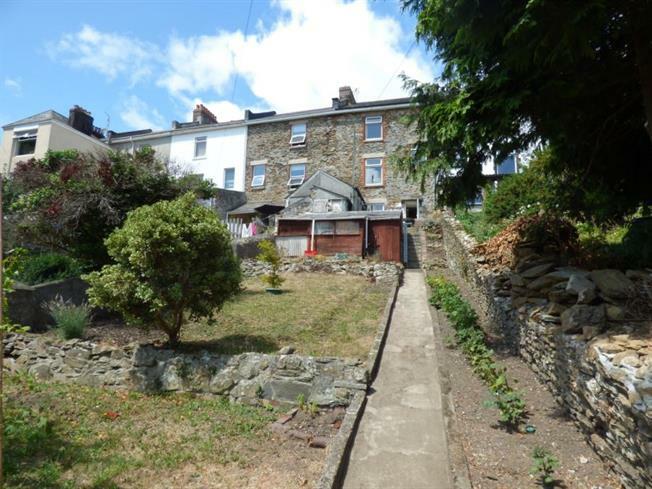 4 Bedroom Terraced House For Sale in Plymouth for Guide Price £160,000. Guide price 160,000 - 170,000. A substantial four double bedroom, three storey mid terraced period town house situated within the popular residential area of Ford. This property offers versatile living accommodation with large rooms and high ceilings. The property also benefits from a large, southerly facing rear garden. Double glazed window to rear aspect. Double doors opening into kitchen/ dining room. door leading to family bathroom. Double glazed window to front aspect. Double doors opening to the living room. door leading to rear hallway. Double glazed frosted window to rear aspect. fitted bath with overhead shower, sink and a door leading to WC. Double glazed window to rear aspect with far reaching views. Patio area with steps leading to storage sheds and large, mostly laid to lawn garden with a footpath running down to the rear access gate at the bottom of the garden.